Did Al Gore win his Nobel for "peace," or did it perhaps come in a new category: comedy? I ask in the wake of his rib-tickling routine on this morning's "Today." 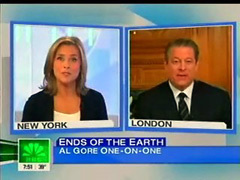 Al, that inveterate card, actually claimed that the MSM's coverage of global warming is . . . too balanced. MEREDITH VIEIRA: Back in 1992, the first President Bush called you "Ozone Man," he ridiculed your efforts to bring attention to climate change. He even called you crazy at one point, so is this vindication of a sort for you? Al took the high road, claiming it wasn't about him. For that matter, why should it be vindication for a leftist to receive an award from a group of leftists, the same people who gave the peace prize to Yassir Arafat and the fraudulent Rigoberta Menchu? A bit later, Vieira, to her credit, did challenge Gore. MEREDITH VIEIRA: You know you shared the prize with scientists from the UN's Intergovernmental Panel on Climate Change, and one of those scientists, John Christy, wrote an op-ed last Thursday in the Wall Street Journal in which he criticized your dire predictions about the impact of global warming [in a flashback to Gore's disastrous 2000 debate with George Bush, Al could be seen and heard shaking his heard and uttering a loud "tsk"], he wrote: "I see neither the developing catastrophe nor the smoking gun proving that human activity is to blame for most of the warming that we see." So what do you make of his assessment? That's when Al launched into his comedy routine. AL GORE: Well, he's an outlier. He no longer belongs to the IPCC, and he is way outside the scientific consensus. But Meredith, part of the challenge the news media has had in covering this story is the old habit of taking the "on the one hand, on the other hand" approach. There are still people who believe that the earth is flat. But when you're reporting on a story like the one you're covering today, where you have people all around the world, you don't take, you don't search out, for someone who still believes the earth is flat and give them equal time. And the reason the IPCC was awarded the Nobel Peace Prize, the thousands of scientists who make up that group, have for almost twenty years now created a very strong scientific consensus, that is as strong a consensus as you'll ever see in science, that the climate crisis is real, human beings are responsible for it, the results will be very bad for the United States and for the entire world community, all human beings, unless we do something about it. And there is still time to solve it. Of course Al didn't mention that the IIPC's vaunted consensus is for a sea-level increase of about 7-24 inches over the century, not the scare-mongering 20 feet that Gore projects. "Inconvenient Truth" would have been a lot less dramatic if Gore didn't use that alarmist assumption, permitting him to show much of Manhattan under water. But I digress. Gore thinks the media's coverage has been too balanced, that they're giving too much time to people who don't buy into his sky-is-falling view of the world? You're killing me, Al. Let'start with NBC, the network where he was appearing, which is celebrating "Green Week," devoting 150 hours to pushing his environmentalist agenda on every one of its programs, from news to entertainment,even to football. ABC is no better. GMA weatherman Sam Champion is nothing less than a global-warming alarmist, and when Gore appeared on the show not long ago host Diane Sawyer bemoaned the fate of polar bears and sighed whether it was too late to save the world. As we like to say, Al will be at the Laff Shack all week. Don't forget to tip your waitress.